Begär offert för att få exakt pris med frakt. Grundpris är 2195 + frakt. The ProBasket Skill is for players that wants to improve their putting skills. 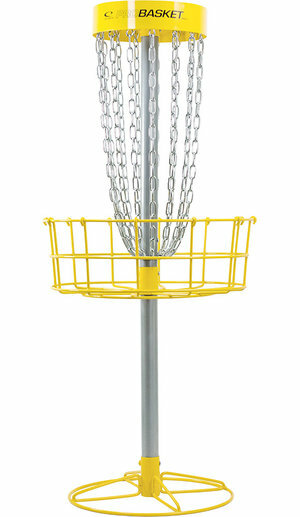 With its narrow profile it will make putting practice hard and fun, but competitions easy when transitioning from the ProBasket Skill to a tournament basket. The low weight, the smaller based mobile foot and divided pole makes this basket easy to move around. • 15 chain sets that are zinc coated. • The ProBasket Skill has a powder coat finish. • Yellow 3″ tall deflector band improves visibility in all conditions. • Tension screws are included for increased stability. • The ProBasket Skill pole is divided in two parts for easy transport and storage. • The ProBasket Skill is mainly meant for portable use. Meaning permanent installation, or prolonged exposure to the elements, can eventually compromise the integrity of the basket’s composition.